Preventive maintenance is the best way to ensure the long life of your car and save you big money on repairs. Some of the best car maintenance tips are also the easiest to do. Any questions about your car’s maintenance can be found in your car’s owner’s manual, along with the recommended fluid types. Following simple car maintenance tips will go a long way in helping make the engine, transmission and your vehicle last longer and maintain value. Keep an eye on your oil levels and be sure to change it out every 3,000 miles. This is especially true for cars with high miles. Oil lubricates the engine parts and disperses heat. The less oil in an engine the hotter an engine runs, causing strain and stress that could eventually blow the engine. The car owner’s manual will state the recommended intervals to change in your vehicle. Doing so will extend the life of the engine and reduce the probability of sludge buildup in the engine. 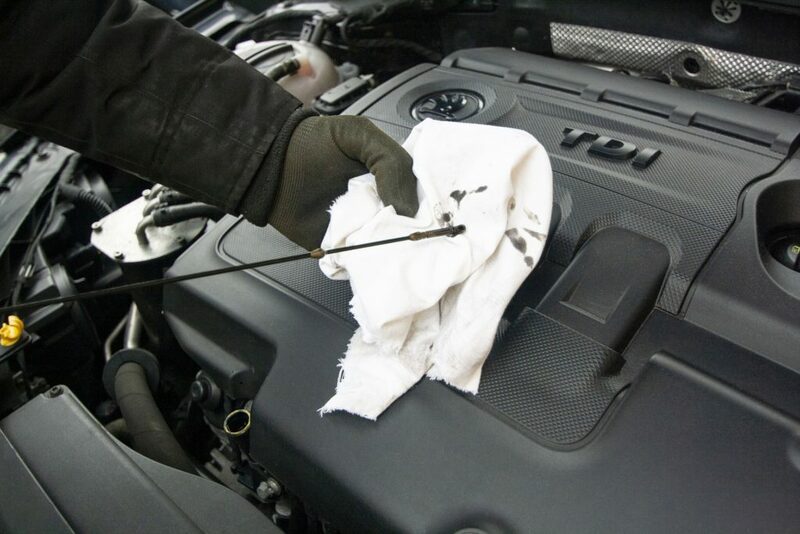 Sludge, a thick, gooey, black-colored byproduct of petroleum, will build up without a regular oil change and will contribute to engine problems. As the key component in a vehicle’s electrical system, the battery needs to be maintained to ensure the car functions properly. The battery should be mounted securely in place and the terminals cleaned and tightened. Top off water levels with distilled water when needed. Check the power steering fluid regularly. If you are hearing squealing noises when turning the steering wheel or find the wheel heavy or stiff when steering, you may need more fluid. The hydraulic power steering pump that allows you to turn the steering wheel with ease is lubricated by power steering fluid. In older vehicles and some new models, the pump’s reservoir has a screw-type cap that lifts off, so the fluid level can be checked. Most (but not all) newer cars have electric power steering and require no fluids. Transmission fluid should be checked regularly and replaced when needed. Having the proper amount of fluid is critical because it cools the transmission, lubricates moving parts and smoothes the shifts between gears. Over time, the lubricating properties in the fluid break down. Frequent stop-and-go driving or heavy loads can accelerate deterioration, and put a strain on the transmission. To check the fluid, park the car on level ground and leave the engine running. Always use the fluid recommended by the automaker. The coolant in your radiator has rust inhibitors that break down after a period of time. Without fresh coolant, rust and corrosion build up, causing the thermostat to plug, damage the water pump, which can overheat and harm the engine. Check the owner’s manual for recommended coolant changes. Some models require a change every 30,000 miles, while others suggest 100,000 miles. The brake fluid levels should be between the minimum and maximum marks in the fluid reservoir. When checking, make sure the car is parked on level ground and always use the automaker’s recommended fluid. Replacing the brake fluid will not increase the longevity of the brake system but it might save your life. Tires are expensive and can wear unevenly and prematurely without regular rotation and the correct air pressure. To endure more miles out of your tires, they should be rotated with every oil change. Air filters ensure that clean air is being filtered through the engine. When air filters become dirty, your car’s performance will falter. Clean air filters increase miles per gallon, helps your engine and air conditioners performance, contributes to lower engine emissions, and ensures you are breathing healthy air in your car. Change filters every 12,000 miles or annually. Damaged and worn wipers can scratch the glass on the windshield and impair visibility when the wipers are needed most. Visually impaired windshields can cause accidents. As a driver, you need a perfect and clear view of the road for safe driving. A scratched windshield is also a costly replacement. When you’re under the hood checking the fluid and oil levels, check the serpentine belt running around the alternator, the fan and other engine components. Over time, the belt will deteriorate or loosen and may start to squeal. Check the belt’s condition and make sure it has the right amount of tension. Any small pieces missing or cracks in the belt are indications that the belt needs to be replaced. Basic car maintenance doesn’t have to be challenging or expensive, and will actually save you more money in the long run. If you prevent issues before they happen rather than react to them when they do happen, you can help ensure a longer life of your vehicle. Have questions about used cars or our car maintenance tips? Contact the experts at Auto Action today!